Hao Tong Li dishes on Chinese vs. American food, throwing a baseball, more. What&apos;s it like to be Li? 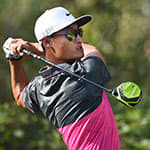 Editor’s Note: Hao Tong Li recently completed his first season on the Web.com Tour. He is the first native of China to earn membership on either the Web.com Tour or the PGA TOUR. Li, 20, successfully retained his Web.com Tour playing privileges for 2016. With his season complete, he has returned to Asia where he missed the cut at the Asian Tour’s Venetian Macau Open and the European Tour’s UBS Hong Kong Open. He then turned it around with a T26 at the European Tour’s Turkish Airlines Open. Li entered the final round of the World Golf Championships-HSBC Champions with a chance at history. Following rounds of 66-69-66, Li stood one shot shy of the lead heading into the final round. He went on to fire an even-par 72 and finish T7, the best finish ever by a Chinese-born player on TOUR. The previous best was a T8 by Wen-chong Liang at the 2010 PGA Championship. Following his first full season on the Web.com Tour, Li gave PGATOUR.COM a first-person account of his experiences. I just finished my first year on the Web.com Tour. Although the season didn’t go as well as I would have liked, and while I didn’t earn my PGA TOUR card, I had a really great time, saw a lot of things and learned a lot. My year began in Panama, at the Panama Claro Championship. That week, I picked up right where I left off after my pretty successful year on PGA TOUR China. In the first round at Panama Golf Club, I shot a 3-under 67 and was tied for third. I was still right near the lead after a second-round 69, tied for fifth going into the weekend. When I shot a 65 in the third round, I held a one-shot lead with 18 holes to play. I started thinking I was going to win the tournament. Maybe that good start worked against me a little. I remember thinking how easy golf seemed the first three days. Well, things are definitely not easy on the Web.com Tour. These players are amazing, how good they are. In the final round in Panama, I didn’t play well at all, shooting a 6-over 76 and tying for 11th. But it was so much fun being in the lead and having a chance to win. That’s why I play golf, so I can have a chance to win. My best golf of the year didn’t come that week, and it didn’t even come on the Web.com Tour. In April, I took two weeks off and returned to China to play in two tournaments—the Shenzhen International and the Volvo China Open. In Shenzhen, I really thought I might win. I was sitting in the clubhouse in Shenzhen following my final round, and I had a two-stroke lead over Kiradech Aphibarnrat. Kiradech had two holes to play. He was really the only player who could catch me. Admittedly, my life could have really changed had I won. A victory would have given me immediate European Tour membership, so a lot was going through my head. Kiradech is a great player, as he’s proved all season long. On the 17th hole, he made a 20-foot eagle putt that tied me, and then he just missed a birdie on the 18th hole that would have given him the victory in regulation. So we had a playoff, and he beat me on the first extra hole. The next week in Shanghai, at the Volvo China Open, I tied for sixth, three strokes behind Wu Ashun. Although it was disappointing, that was an amazing two-week stretch. Unfortunately, I never played as well during the rest of the Web.com Tour season, and I eventually finished 49th on the money list. That wasn’t enough for me to earn PGA TOUR membership—that goes to the top 25 money-winners—but it did secure my Web.com Tour membership for 2016. As I think back on the season, I think of the fun I had, and all the great people I met. I was even able to spend some time with PGA TOUR Commissioner Tim Finchem in his office at PGA TOUR headquarters. Hao Tong Li meets with PGA TOUR Commissioner Tim Finchem. But one of the best weeks of the year came in California, at the Stonebrae Classic. I arrived in Oakland from Boise, Idaho, on Monday, and that night I was able to visit San Francisco for the first time with a few friends. San Francisco is a really interesting city, and visiting Chinatown was very fun. I felt right at home. It was dinnertime, and we were hungry, so I stopped in a gift shop and asked the store owner where she liked to eat in Chinatown. She said, “R&G Lounge,” and pointed the way about two blocks from where I was. We all walked to that restaurant, but when we arrived, there was a one-hour wait to get a table. Disappointed at how many people were ahead of us, we decided to go somewhere else. Two days later, playing in the Stonebrae Classic pro-am, I greeted my amateur partners, and all of them were Chinese. One of the men, Kinson Wong—wouldn’t you know?—owned the R&G Lounge. So I was able to eat there after all, when he invited me to join him Sunday night. Following my final round at Stonebrae, we drove across the Bay back to San Francisco, and Mr. Wong had a parking spot waiting for me in front of his restaurant. We then ate an incredible meal, with Mr. Wong, his family and my two other pro-am partners. The food was excellent, and Mr. Wong joked that “RG” stood for “really good.” The lady in the store who recommended R&G Lounge knew exactly what she was talking about. Yes, really good! Earlier in that same week, I had the opportunity to attend my first Major League Baseball game as a guest of the Oakland A’s. The team invited me to throw out the ceremonial first pitch before the A’s played the Minnesota Twins. I had never thrown a baseball in my life, and I was pretty nervous. Fortunately, I practiced throwing in the hotel parking lot the night before, so when I stood on the field in my No. 2 Oakland A’s jersey before the start of the game and I heard my name on the loudspeaker, I was ready. I made an OK throw to Oakland player Evan Scribner. But I think I’ll keep my job as a golfer. Li takes the mound as he readies to throw the ceremonial first pitch at an Oakland A's game in July. The Bay Area in California was one of many interesting places I visited this season. I enjoyed my time in Latin America, early in the season. I played in incredible wind in Cartegena, Colombia, and I thought Brazil was a lot of fun. I plan on returning to that country twice in 2016, once for the Brasil Champions presented by HSBC in Sao Paulo and then again, hopefully, representing China for the Summer Olympics in Rio de Janeiro. It was really hot in Kansas City in August, and the weather was pretty cool in Nova Scotia, Canada, a month earlier. I played on a lot of tree-lined courses, and I was in awe of the enormous Utah mountains that served as a backdrop to the Golf Club at Thanksgiving Point. I hit a lot of quality shots during the season, probably my most memorable coming late in the third round at the Chitimacha Louisiana Open in Lafayette. I was chasing leader Rick Cochran, and on the par-4 finishing hole at Le Triomphe Golf and Country Club, I hit my 9-iron third shot exactly how I wanted. I flushed it, and the ball landed and rolled to about 4 inches from the cup for an easy birdie. There was a big crowd gathered around the green, and they cheered super loud for me as I moved into second place with 18 holes to play. Unfortunately, I couldn’t finish my business and win that tournament. But I learned a lot that week—all year, actually—and now that the season is over, I think back to something Bubba Watson told me. At the Shenzhen International, I played three consecutive rounds with Bubba. He gave me a lot of tips, and one thing really stood out. He told me that when he was playing on the Web.com Tour, he felt like he was a better player on that Tour in his second season than he was in his first, because he already knew the courses and was prepared for them the second time around. I hope that’s the case for me as I continue chasing my dream of playing on the PGA TOUR.